The Damrak harbour (Amsterdam’s “inner harbour”) is the mooring place for merchant ships arriving from and departing to exotic ports across the globe. Here herbs, fruits and spices are unloaded before being weighed and tested for quality. 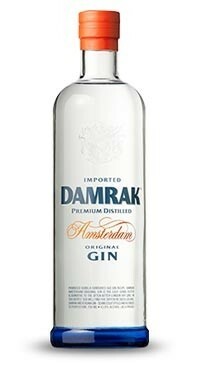 Who or where Gin was invented is not actually clear, but it is evident that the Dutch make delicious Gin and Damrak is one of the best. Distilled in the Lucas Bols distillery in the heart of Amsterdam. This Gin is anything but a London dry; it is fresh with lots of citrus notes. There are 17 different ingredients that go into Damrak Gin. The main distillate is Curaçao orange followed by other citrus fruits. The juniper is noticeable, but not dominant in this particular gin. Other herbs and spices include angelica root, cinnamon, lavender and star anise.